Be it Baloo, Yogi, Rupert or Pooh – cinema seems to have a fondness for a cuddly, friendly bear and next in line for the big screen we have Paddington. The books were written back in the 1950s so it seems strange that it’s taken until now to get the marmalade-loving grizzly into cinemas, particularly considering there is no real fan base in place to guarantee viewers. That said, the film has come with something of a fanfare, trailing positive reviews and has secured a festive release date with no real competition so it seems to be a force to be reckoned with. The film boasts an excellent cast, with Hugh Bonneville and Nicole Kidman topping the bill as Paddington’s guardian and taxidermist nemesis respectively. Smaller parts are filled by acting royalty such as Julie Walters and the always brilliant Jim Broadbent and it is clear there is real love for the source material, I suspect borne out of nostalgia for the original storybooks. 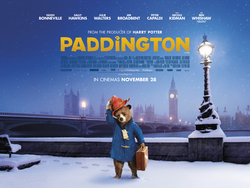 There has been some media controversy in the plot – we begin with an origin story of Paddington’s arrival at the London station from which he acquires his name, and see him adopted by the Brown family before being pursued by the aforementioned Kidman who wishes to add poor Paddington to her taxidermy collection at the National History Museum. I was surprised at how much I enjoyed this film, considering I am not its target audience of either children or nostalgic adults who remember the original. To say there are jokes for adults and children alike seems glib in today’s Pixar age where this is the norm. However, the slapstick, ‘childrens’ humour is genuinely funny and I suspect the ‘grown up’ jokes could be laughed at by a lot of pre-teens too (I particularly enjoyed the use of Lionel Richie’s ‘Hello’ during one scene!). This is what marks Paddington out as a true family film, it can be enjoyed by all generations, and I can see families gathering round to watch it at Christmas when it is inevitably shown on TV in future years. On that note, my worry for this film is that I felt it had been marketed too young for its content. The 4 year old sat on my row who had attended with his father, was bored from the first scenes and began shouting ‘I want to go home’ after around 15 minutes. I got the feeling some of the other youngsters became restless during the film too. From memory, the Paddington Bear stories are bedtime stories for 3-6 year olds, whereas this film plays better to an audience of 8-12 year olds. Still, the marketing isn’t the fault of the filmmakers, and director Paul King (best known for directing The Mighty Boosh) does an excellent job in giving enough screentime to the supporting cast, while ensuring the viewer still knows that Paddington is the star of the show. A brief mention must also go out to the location scout, who should be rewarded by the London Tourist Board, as the city looks wonderful in every shot. In summary, not a classic by any means, but a heart-warming and feel-good trip to the cinema. Pass the marmalade!